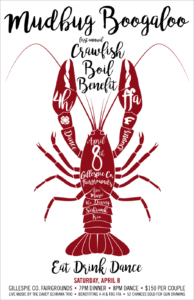 Join us and the Gillespie County 4H and FFA chapters for the first annual Mudbug Boogaloo Crawfish Boil Benefit for 4-H and FFA Saturday April 8, 2017 at the Gillespie County Fairgrounds. Purchase your tickets, $150 per couple, at Arrowhead Bank, Allied Ag or by calling 512-567-4682. Come eat, drink and dance to live music by the Davey Schrank Trio. There will also be 52 chances sold for a gun drawing. Dinner starts at 7pm and the dance kicks off at 8pm. Support local Agriculture education instilling core values of hard work and the agriculture industry in our youth. Lochte Feed and General Store is proud supporter of Gillespie County 4H and Fredericksburg FFA members. Stop by our location for all your show feed, show supplies and even an outfit for show day. This entry was posted on Monday, March 27th, 2017 at 10:51 am	and is filed under Events, News & Updates. You can follow any responses to this entry through the RSS 2.0 feed. Both comments and pings are currently closed.